28-year-old David Desper (right) has been arrested and charged in the road-rage shooting death of 18-year-old Bianca Roberson. 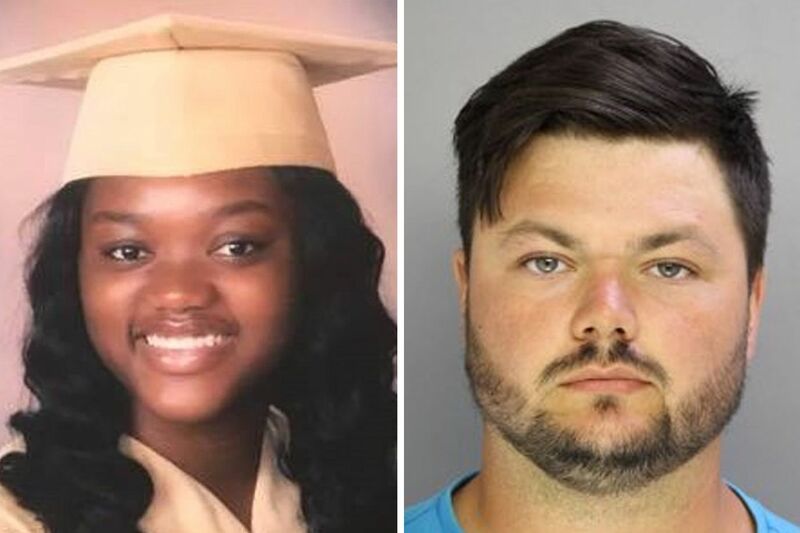 A Trainer man who shot and killed a teenager in a road-rage incident on a Chester County highway was sentenced Thursday to 20 to 40 years in state prison, the statutory maximum for third-degree murder, in an emotional hearing that brought even the judge to tears. David Desper, 29, had pleaded guilty in September in the death of Bianca Roberson, 18. After hearing heartbreaking testimonies from Roberson’s family and friends, and remorseful words from Desper, Chester County Court Judge Ann Marie Wheatcraft wept as she handed down her sentence. Shackled, and dressed in a purple shirt and striped tie, Desper hung his head and cried, his body shaking. Beside him, his attorney, Daniel McGarrigle, who had asked for a lesser sentence, shook his head. In the front row of the packed gallery, Roberson’s mother, Michelle, reached for the hand of Roberson’s father, Rodney. “I’m satisfied, a little bit. The family is somewhat relieved,” Roberson’s father said. “People make mistakes. But some mistakes you can’t come back from." Through tears, Desper told the judge he wished more than anything that he could take back the split-second decision to pick up his .40-caliber Smith & Wesson semiautomatic pistol from on top of his truck’s center console and fire out his open window at the driver beside him on Route 100 southbound during the evening rush hour on Wednesday, June 28, 2017. Rodney Roberson still wanted answers, particularly to one question: Why? Desper was afraid, he told the judge, as Roberson’s green Chevrolet Malibu swerved toward his red Chevrolet Silverado pickup truck. Prosecutors have said Roberson was not driving recklessly, and Wheatcraft said she didn’t buy Desper’s account. As Roberson’s car veered off the road, Desper fled home to Delaware County, then went on a beach trip with friends, where, prosecutors said, he played mini-golf, ate pancakes, and acted normally until confiding in friends and family about what had happened. Desper’s mother, Wendy, said she received a call from her son just hours after she posted on Facebook about the manhunt for the “jerk who killed a high school graduate." On the other end of the line, her son said, “I’m so sorry. I screwed up. I did something I can’t take back,” she said. Immediately, she said, she knew what he had done. McGarrigle, Desper’s attorney, said his client was a “harmless, almost juvenile" man who did not drink or do drugs, and had no criminal record before the killing. As authorities searched Desper’s bedroom last July, McGarrigle said, he noticed that Desper had plastic stars above his bed and Camaro posters on the wall. But to prosecutors, and Roberson’s family and friends, Desper was just that — a threat to society who deserved nothing short of the maximum sentence, they said. Rodney Roberson recalled memories of his “little girl,” whom he and his wife decided to raise in Chester County, not his native West Philadelphia, to keep her safe. Even as his daughter grew up, got a job, and prepared for college, he worried about being able to protect her, he said. But all of his hopes for her were coming to fruition, he said, until she crossed paths with Desper. Bianca Roberson loved to listen to Luther Vandross' “Dance With My Father" with her dad. Rodney Roberson said he would tell her that the song, a ballad about a man longing for his late father, was morbid. Now, he finds solace in it. Michelle Roberson said her daughter lived to help others, always going out of her way for people who were struggling or alone. Bianca Roberson encountered Desper while driving home to West Chester from a shopping trip in Exton with her mother and grandmother. Michelle Roberson said she wanted her daughter to head straight home that day. Unbeknownst to her daughter, she had been tracking a package of dorm bedding and decorations, and knew it would be in the driveway when her daughter returned. But Bianca Roberson would never make it home to open the package. As the recent Bayard Rustin High School graduate merged lanes, near where the bypass connects with Route 202, she jockeyed for position with Desper. Unwilling to give way to Roberson’s car, Desper grabbed his gun, the one a friend said Desper often kept in the center console, and fired a single shot. The bullet struck Roberson in the left side of the head, and her vehicle went off the road, eventually resting against a tree. The case was considered a traffic accident for a day, authorities said, until the coroner found the bullet in Roberson’s head. That finding set in motion a three-day manhunt for the man in the red pickup truck. As officials searched for Desper, he confided in a friend, telling the man “Whoa, I really ... up, man," according to documents read at a hearing in the spring. Desper eventually turned himself in on July 2, allowing authorities to search his truck and his family’s Trainer home, where the gun was found. Since that day, Desper has been held at the Chester County Correctional Facility. He will now be transferred to a state prison. He was originally set to go to trial in September, but instead he entered an open guilty plea, which means he was not promised a certain sentence. Prosecutors said they accepted a plea of third-degree murder because they worried that a jury might not believe that Desper intended to kill Roberson with that single shot. McGarrigle argued Thursday that Desper should receive credit for turning himself in, helping authorities with the investigation, and sparing the Roberson family the pain of a trial by pleading guilty. Wheatcraft did not tack on a consecutive one- to two-year sentence for possession of an instrument of crime, she said, because Desper pleaded guilty. McGarrigle declined to comment after the sentencing and said he did not want to discuss whether he planned to appeal.